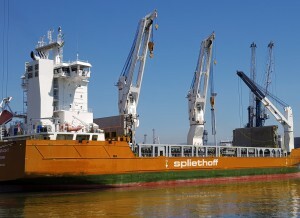 Spliethoff’s P14-Type and P8-Type vessels are flexible heavy lift vessels equipped with two NMF cranes of respectively 700 mt SWL (combinable to 1.400 mt SWL) and 400 mt SWL (combinable to 800 mt SWL) and one NMF crane with an SWL of 180 mt. High crane pedestals and long crane jibs facilitate large lifting heights which are available at all outreaches. The beam of the vessels also ensures that the cranes can be used to their full capacity, without the need for a stability pontoon. P-Type vessels have a combination of folding hatch covers and rolling covers for the upper deck and tweendeck pontoons. These pontoons can be positioned in four different levels, depending on the hold. 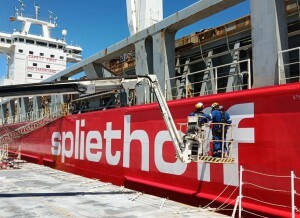 Spliethoff’s P-type vessels are equipped with two holds and have a capacity of 26,337 m3. Furthermore, the vessels are suitable to sail with open upper deck hatches, enabling high objects to be carried in the lower hold, protruding above the main deck, thus providing additional protection for sensitive cargoes. An automated anti heeling system additionally ensures a very efficient operation for lower weight cargoes. With DNV GL 100 E3 Ice Class notation, this vessel is suited to sail in Arctic waters.